Military personnel receive a Buddhist amulet to give them courage and keep them safe in the Far South. More than 1,000 marines received well-wishes and blessings as the Royal Thai Navy rotated troops to the Far South. 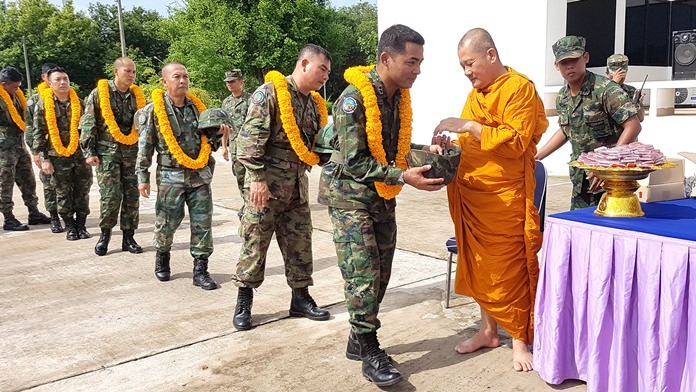 Navy commander-in-chief Adm. Na Areenij presided over the Sept. 13 ceremony at the marines’ Phra Maha Jetsadarachao Camp, offering all the troops a Buddhist amulet and encouragement to stay safe in the three strife-ridden provinces. In all, 1083 marines in 12 units – covering patrol, combat, air, medical, ordinance, inspection and support – shipped out, along with 100 female Ranger volunteers, who assist enlisted personnel and wage the government’s “hearts and minds” campaign in Muslim-dominated Narathiwat, Pattani and Yala. Adm. Areenij thanked the troops for their sacrifice and urged them to be careful and follow orders. Sailors from the Air and Coastal Defense Command would get a similar send-off Sept. 15, with ACDC commander Rear Adm. Eagarat Promlumpug leading the proceedings. The sailors received blessings from Santiburapatit, the Sattahip District dean of monks, and Boonsong Jantimo, assistant abbot of Thepprasit Temple, who became famous for chants that many believe led rescuers to find the body of a missing person in a forest after many failed attempts. In all, ACDC 288 troops were dispatched the Far South, as well as airport and marine security officers to Songkhla and Trat.